HabitBull is a wonderful application for tracking your habits. I briefly mentioned this application in my article about Building Habit or System. 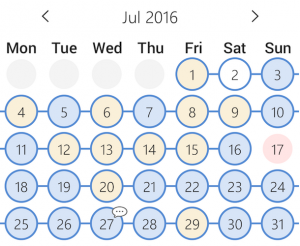 I have been personally using this application to track my website management habit. In this article, I will some of the awesome features of this application. HabitBull is available for free on both Android and iOS. The free edition allows you to set up up to five habits at a time and is a definitely a good place to start. Here are my favourite five features of HabitBull. 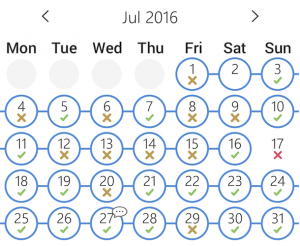 I am sure most habit tracking applications allow you to track habits that you want to every day or 3 times a week. But do you want to set up a habit that you do 3 times a day, 20 times a month or every 3 days? Then HabitBull is the definite answer. Using Habit Bull you can set up the type of habit you want to track, its frequency and length. Some habits can be tracked with a simple “Yes” or “No”. But what makes HabitBull even more effective is its ability to track values. For example, when tracking your writing or running habits, the number of words or miles are more important than a simple Yes or No answer. I find this useful to keep track of the number of hours I have worked on a project or number of words I have written over a period of a month. 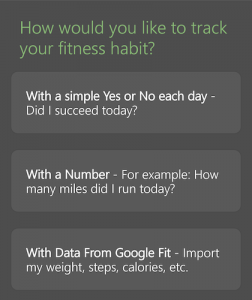 You can also import data from Google Fit like your weight, steps, calories, NIKEFUEL points and Adidas Jump Height for your fitness goals and habits. 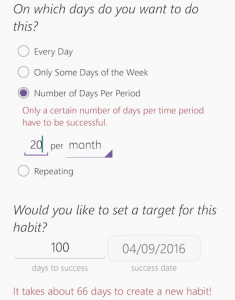 In HabitBull, you can set your custom frequency and duration for each of the habits you want to track. You can also set a target date or a target number of times you want to track the habit for. One of the most powerful aspects of HabitBull is its reminders. It just won’t let you forget about your goal. The application can remind you to update it if you have been away for too long. 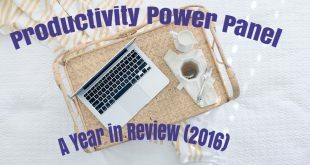 But the powerful aspect is that you can set individual reminders for each of the habits you are tracking. This is handy when you want to set reminders for different times based on the day of the week. For example, if I have my Bible Study on Thursday evenings then I set the reminder to update my website on Thursday mornings. But on weekends, I set my reminders for late evenings. If you are tracking habits on which you are working throughout the day like keeping yourself hydrated by drinking water, then you can set multiple reminders throughout the day too. For example, you can set reminders between 7 AM and 10 PM for every 4 hours reminding you to drink a couple of glasses of water to hydrate your body. 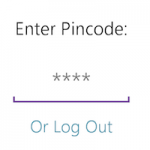 If you are using HabitBull to track some of your private goals, you can keep away prying eyes by setting a 4-digit “Pincode” for the application. If you navigate away from the application, it will lock itself. Further on, you can enter your 4-digit code to gain access to the application. But anyone else who gains access to your phone will not be able to view the data unless they know your code. 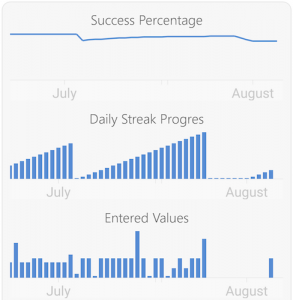 HabitBull shows you some impressive graphs and stats that helps you visually see your progress over a period of time. In the pictures below, you can see how I am tracking my writing goal. The graphs show that I am not very consistent with my writing goal. I tend to start small and then go high until I hit another writer’s block. 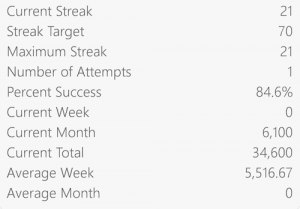 The stats show me how many words I have written in total (34,600) and how many I have written this week and month. In HabitBull you can have a monthly view of a single habit or a weekly view of your habits. You can also choose one of the three colour choices for tracking – Green/Red, Blue/Red or Checks/Crosses. There is a premium version of the application available for a one-time fee of just £3.99. I had been using the free edition for over 2 years and was pretty pleased with it. But recently I purchased the “Platinum” edition when I started switching my devices occassionally. Here are my favourite three features available in the Platinum edition. This premium feature allows you to download the entire data in a csv format. This can then be used to generate custom graphs and charts. This premium feature allows you to sync data to cloud, which in turn gives you the benefit of using the application across devices and also having your data backed up. The premium version of HabitBull allows you to have widgets on your phone screen for easy tracking. Although, I don’t use the widgets frequently, I sometimes add them (especially for the weekends) as a visual reminder for focussing on my goals. I installed HabitBull after I saw your post. I like it how you don’t push the premium edition to your readers and instead start with the features for the free. I purchased the premium edition for the same reason as you – multiple devices.